Yes, you did read the title of my article right. It’s no joke, Blizzard did officially announce that they will host their own vanilla/classic servers in the future. In other words, you will be able to go home, to experience the good old days of World of Warcraft. Do you want to go home? Yeah, “You think you do, but you don’t!” is the Blizzard motto of the past. The new motto is “Your favorite flavour is vanilla!“. Yep, I repeat myself, but how can you not with such a news. Blizzard will do it, vanilla officially gets a come back! The legacy WoW community did it, we showed demand, and now it’s happening. But using the modern infrastucture doesn’t mean that the classic servers will have the same features as the modern version. There won’t be a cross-realm feature, also no LFR, dungeon finder or automatic party matchmaking. Brack says they are committed to recreat an authentic Vanilla World of Warcraft experience without all the modern features that the legacy community dislikes. So, yeah, they are pretty serious about it as it seems. It’s finally happening. It’s a bit ironic, because a friend and me got this idea years ago. We didn’t saw it coming, but it was more that we said “Imagine Blizzard would create alternative realms where you could experience classic, maybe even Burning Crusade or Wrath of the Lich King?”. As said, we didn’t saw it coming, it was just one idea we had in our mind too. It’s not the first time we got some ideas that actually came true years later. When that happened, we often laughted and said “They should hire us as game development consultant!”. Now let me set something in stone, maybe I can laugh about it in a few years too. I stay with the idea. Classic servers are already a great news, but it’s not just about classic. The journey from classic through the Burning Crusade expansion to Wrath of Lich King was awesome too. The early expansions were all great. The direction was so different, the whole experience was in my opinion so much better. There was a point where they completely changed the direction, the point where everyone I knew slowly stopped to play the game. It would be fun if Blizzard would set up a server where they let you experience classic World of Warcraft, but where they also enable the Burdning Crusade expansion after one or two years, and then Wrath of the Lich King and so on. Basically a server that repeats the whole story, a progression classic server. Now let me publish my post, but it would be funny if I come back in a few years and this idea came true. That would be awesome. ohhh this is wonderful. I might just save my money and come back, if this happens. I was actually thinking about WoW today, and missing the heck out of it. attempt a PUG, even in the old days. Why, I might even join a guild again. It may be that they realize those of us who leave are not leaving the game that we remember, but the game that this turned into. If that makes sense. Yep, and letting J. Allen Brack announce the classic news, that’s really a classy excuse to the classic fanbase. Very funny, but it seems that’s their way to say sorry. But as I mentioned at the end of my post, I would be even more excited if it’s some kind of a progression classic server. They could repeat the whole story, they could let us go through all expansion again, or at least the early expansions. There would be different ways to switch through expansions… by player votes, by progression (majority of players is through content) or by shedule like every one or two years. It would be cool, because I liked Burning Crusade and Wrath of the Lich King too. i would like to revisit certain places, ‘before’ they became Horde driven, or before they became Goblin building sites. Or Sights. Possibly even the harbor at Stormwind when it was less magnificent and far more interesting. My very first character was alliance, and I played that during classic. Around Burning Crusade several of my friends wanted to try out Horde and we liked it. So, we played the remaining time until today for the Horde. Yep, I second this. I’d like to revisit old places, quests and so on too 🙂 I actually did this already on a private classic server, but I trust Blizzard more than some strangers who did set up an old WoW server. So, this news is really big. And in addition to pulling in older players who remember Vanilla, it might very well pull in younger players who view Stormwind and IronForge and all of that as just so much busywork, hardly worth the effort. I was just over in YouTube reading this last year’s efforts on this, and it’s fascinating to see. And that someone actually listened. Like you, I’ve played a lot of games over time, and this is almost the only one I can think of that has actually listened (and money speaks very loudly, doesn’t it) to what it’s customers and former customers are saying, enough to actually attempt to implement this entire process. I played exclusively Alliance until this last year, and then switched over to Horde; the story line is far more intimate, far more one-to-one, and if this fires up again, I might try Horde this time, and see what happens. Maybe one of each. Yes, with this step they do definitely gain trust again. Also as you said, it’s very rare, especially to dig out old versions. I can’t remember if any developer ever did that except for HD remakes of old games maybe. I hope it becomes a trend, I’d like to see this happening more often. 🙂 As they said, the old version is gaming history, and it’s cool to preserve it. We will most likely play horde again, after so many years we do indentify with this faction (laugh). I talked about this with a friend yesterday, we’re just used play for horde and we liked it. I jusr sat through the last two versions of the last hours of Nostralius (sp). First the Horde mass suicide, the entire version of which had me in tears, and the Alliance side, which consisted mostly of marching around IronForge and shouting obscenities at the screen. There is something about people who play Horde, they seem more together, more united, more careful. But what interests me the most, is the now familiar phrase “you think you do, but you really don’t” which is going to deservedly dog that fellow’s footsteps forever. No matter what happens, that phrase will live for a very long time. I can’t remember when I have been so moved by a video game’s ending with those Horde players jumping off a cliff. My first memory was of my female alliance mage, walking to Menethil. In those days there were no maps that showed anything unless you had been there, and if you were new, you got no clues. I was about halfway through the WetLands, totally lost, a lvl 9 player who had discovered that if you died, you might get autotransported further down the road rather than back–and I happened on a player sitting in the middle of the road. He said, ‘where you headed?” and I asked him if this was the road to Menethil, and he said “yes, but you will have to cross a broken bridge to get there–when you cross you’ll be attacked by a giant Crocolisk–don’t fight him, just run like hell and youll be fine.” And I thanked him, and outran the crocolisk and found Menethil. And ships. Looking back, he might well have been part of the Blizzard team, playing his own game. They did, in those days, and you never really knew when one would appear or help you. That is funny. He was having a good time, wasn’t he. I often wonder about some of the players I’ve met who seem unusually helpful, and wonder if this is a GM on his time off, playing his own game. I miss encounters like that, they did make you feel that this was a game they played, too. I think the anger we see on the community boards is as much about the distance now between GMs and the players. If and when I do go back, I will be steering clear of the Discussion groups. Im sure half of them will be sneering and half of them will be totally against the poor quality of the play, and the other half will be finding nits everywhere. Best to stay away. Im wondering what happens to our former characters. Do we start them over at level 1 and broke, or can we transfer money to them? I do recall that Vanilla was not a cheap game to play, everything cost a huge amount of money and we did live in the AH gearing up. one other thought. J. Allen Breck. I have taken a dislike to this man, not sure why: he is, to be fair, the one they tied to the masthead (paying for his stupid comments) of this thing, and he handles it well. However, watching it again at various times, I’m struck by his eyes, that don’t really smile, do they. Little dead orbs above that strange wide smile. And in watching it again, there is no energy from him, no sense of any kind of “how COOL this is” and maybe he really doesn’t care. He also walks like Bob Hope which is not a plus in my books, either. I noticed it too. I think it was just courtesy from Blizzard to send him on stage to tout the news. On several communities everyone noticed that this is basically now a “meme”. He probably agreed to go on stage with this because backthen it backfired so hard on him. I think it was fair from Blizzard, because otherwise he would have been the laughingstock for the fans and probably also at the company. For him it was just a “Yeah, I’ll do it, I don’t want to be that guy in the web that everyone laughs about”. So I guess, he went on stage to just close this up. I spoke with a friend yesterday while we played PvP matches in WoW…. we both think they are divided, it’s not just the community that has different tastes, Blizzard is probably divided internally too. That’s what we take from the quote that even internally some people demanded that there should be a solution to be able to play the classic version of WoW again. I think Breck was on the other side, and he became the punchbag of the community. That’s probably why he didn’t show emotions, it’s not his thing, he just wanted to close “hate-train” that was caused by his older comments. From his slightly sardonic comments “thanks a lot, guys” I got the impression that he hay not have wanted to to this, but had to. I suspect he will be the laughing stock of Blizzard fans for quite some time, in any event. I think it’s understandable if people are divided on this new step, And going this route will involve a great deal of playing down special effects and figuring out how to tell people who expect it, that Vanilla is not a flight path. And there is no hurry. Damn if this works, I may even try on a guild again. I am curious when they will release those servers. A friend and me, we think it’s probably not before the next expansion. I am very interested to get more news on this in the future. 🙂 Back then I had a lot of time to play games, today it’s less so which means it will probably take me quite some time to just become 60. We will take our time too, no stress.. just enjoying the classic gameplay. one parting shot (possibly) about all of this. I came in before Cata, but left at that time just before Cata ended, destroying a LOT of landscapes. In the next expansion I discovered that the damage was endless, everywhere. I hated it, I hated how ugly it got after that, and how hard it now was to travel on the older paths. 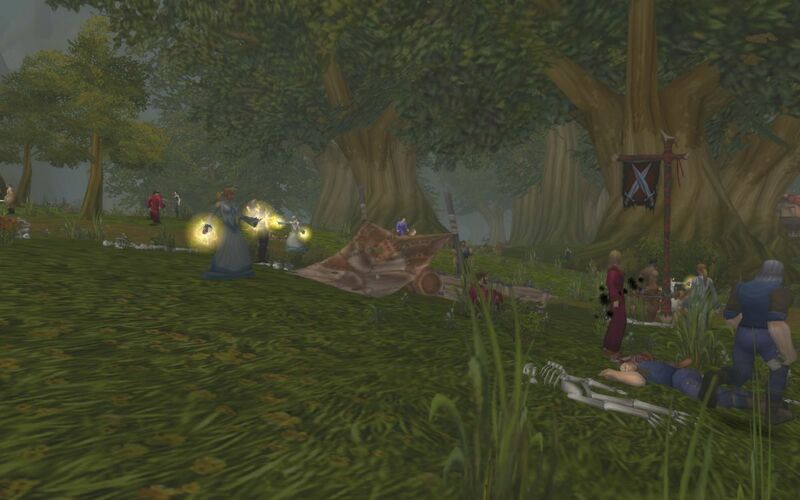 There are people playing now who have been at it only since after Cata, who have never seen Wow at it’s beginnings. It was harder, in many ways, and more frustrating, since the graveyards were usually a healthy gallop away from almost anything (I recall the run to one beach quest in Tanaris from the only graveyard there was a good solid five minute gallop), and the mailboxes were NOT on every corner. But anyone who experiences the new Old WoW will be amazed at how many quests there were and how they connected to each other. And they were frustrating as hell, in many cases. That last ghostly witch, the final three flowers for the spell…and when you died, damn but didn’t you take damage. But we also helped each other out, too. When I look back over the changes, I find it became more and more a war zone game, with fewer places of interest. There were some marvelous, complicated dungeons that no longer exist. Now it all seems to be flame throwers and forward motion, at top speed. I myself didn’t find vanilla very frustrating. The game came during a time when our circle of gaming friends demanded more and more complex games. Or when people became bored of games that you could beat in no time. When we started with WoW, we were totally impressed by the size of the game world, and how much immersion or things to do it offered. Of course, there’s always a bit of frusttrations when things don’t go well in a game, for example when I died a couple of times in a row because a higher level enemy “ganked” me. But it was never the type of frustration that made me stop playing the game. It was more part of the immersion, it’s a dangerous world, that was really how it felt. I think this is the main reason why people become nostalgic when they think about vanilla, they completely removed the immersion from the game. As I have my subsciption active right now, I see what I am doing in the modern game. We played it for about 3 weeks to be extremely well geared, now we usually log in a few times in the weeks to press a few buttons (send NPC’s on missions, do the daily free world quest with the focus crystal, check the in-game mailbox for gold from the auction house and so on), until we decide to log-off. There is no real incentive to play the game. Ok, we checked out every raid, we played a bit of PvP on some days… but overall, it’s extremely boring. Even checking my gold balance is hilarious, because currently I don’t actively work to get more gold, but yet the game throws it at me. It’s a complete joke what the game has become. I find the state of the current game more frustrating than the fact that I had to run long distances when I died in vanilla (as example). Today, the game is incredible frustrating, because part of me enjoys the world (the typical comic style textures, scenes, places), but the other part of me hates the game for the fact that it is now basically a wallpaper and nothing more (it looks good but feels bad). I can’t immerse with a 3d world that takes away the main point of the definition of a game, the challenge. I think that’s a really good idea to come back to vanilla servers. Doing dungeons alone is not possible. World of Warcraft is for groups of players but not for solo gamers.